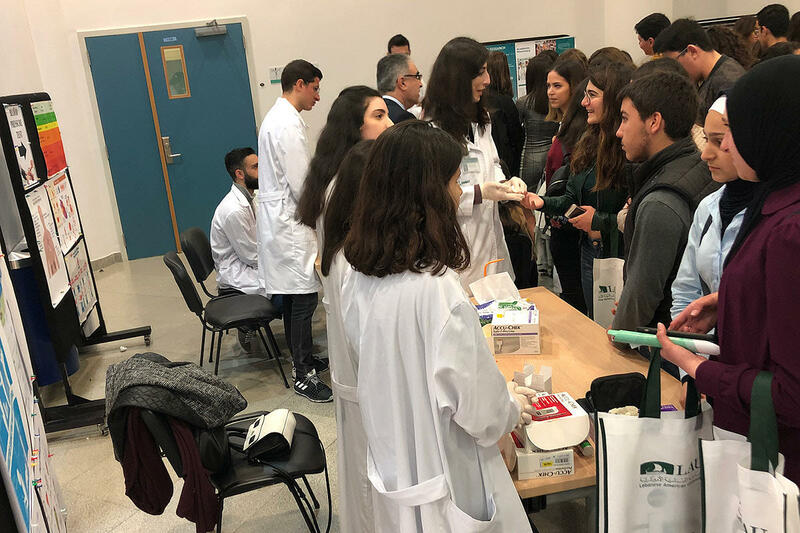 LAU welcomes high-school students interested in pursuing a degree in pharmacy. Current SOP students were on hand to give out information about financial aid, the curriculum, and career prospects. Prospective students were eager to learn more from current SOP students manning the booths. The packed auditorium on Byblos Campus. The students during a tour of the Clinical Simulation Center. The students also visited the school’s teaching and research labs. 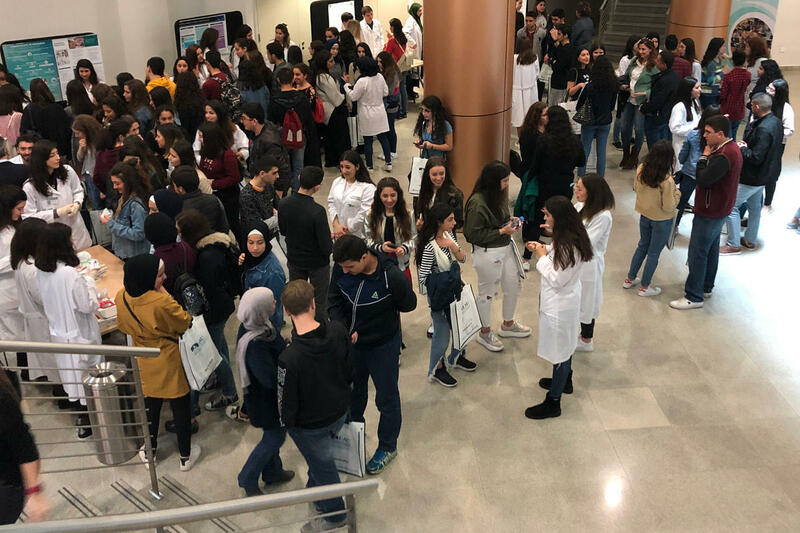 Among a sea of white coats, excited high-school students and their parents gathered to learn what it’s really like to Be a Pharmacist for One Day at the School of Pharmacy’s (SOP) fourth annual Pharmacy Day event. As many high schoolers approach graduation, they are overwhelmed with choices ranging from majors and career opportunities to housing and financial aid. On Saturday, March 23, LAU’s SOP administration, faculty, and students aimed to answer questions that loom over students and parents. 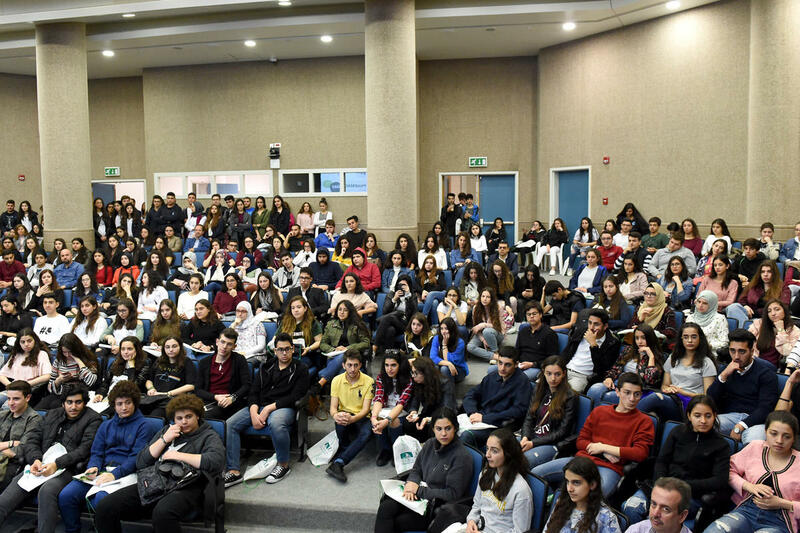 Assistant Vice President for Enrollment Management Abdo Ghié encouraged the students to use the event as an opportunity to learn as much as possible about LAU’s SOP. “My advice to you is this: do not be shy; speak to as many of our students as you can. You should leave here with all of your questions answered,” he said. In his welcome address, SOP Dean Imad Btaiche acknowledged the day as a first step for students and parents toward a successful experience at LAU’s SOP. He also applauded the 52 current SOP students who were there to demonstrate what the school stands for. Current fourth-year SOP student Gaelle Matar, shared her experience in transitioning from high school to LAU. Although she found her courses challenging and time-consuming at first, she continually reminded herself why she chose pharmacy. “It is my passion for making people’s lives bearable that keeps me going whenever I face challenges,” she said. Matar also encouraged prospective students and parents by noting that LAU’s SOP makes a pharmacy degree attainable through its recognition of students’ academic achievements, leadership skills, and financial need. Matar went on to cite all the ways LAU has helped her shine: whether through active membership in health awareness clubs or involvement in international organizations such as ERASMUS, students like Matar experience personal growth along with academic development. Prospective students and their parents were then given the opportunity to browse the booths manned by current SOP students who were eager to answer questions about financial aid, the curriculum, and career path opportunities. “Today is an opportunity for me to offer guidance and show these students what is waiting for them,” said fourth-year SOP student Celine Richani. In addition to meeting students at the booths, the attendees also had the opportunity to tour the school’s teaching and research laboratories and the Clinical Simulation Center (CSC). 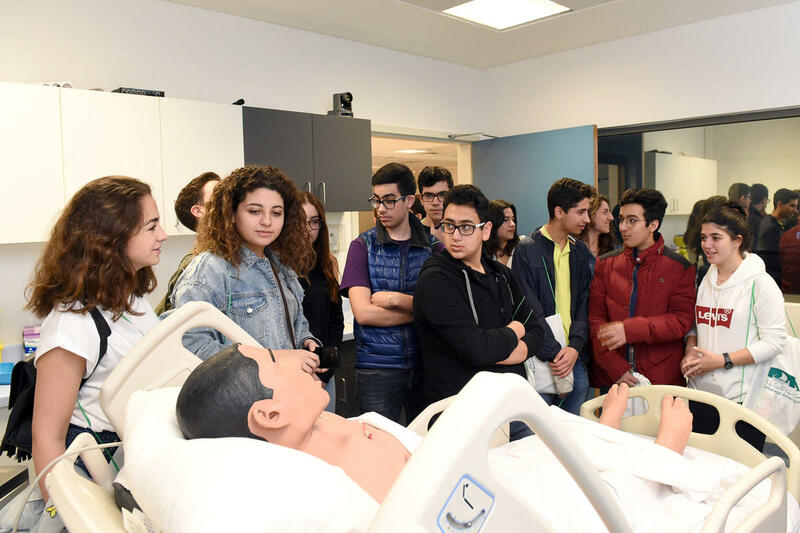 The CSC is a state-of-the-art facility used by LAU’s Gilbert and Rose-Marie Chagoury School of Medicine, Alice Ramez Chagoury School of Nursing, and the School of Pharmacy. The fully equipped simulation clinics include hospital-grade equipment, high-fidelity mannequins who have the ability to exhibit symptoms, and trained actors who pose as patients for students to practice real-life scenarios under high-pressure conditions. “The CSC is a unique advantage that separates LAU’s SOP from other programs. It supports LAU students’ interdisciplinary learning and integrates simulation technology into the pharmacy curriculum,” said SOP Clinical Associate Professor Wissam Kabbara. The prospective students were soaking up every bit of information possible. 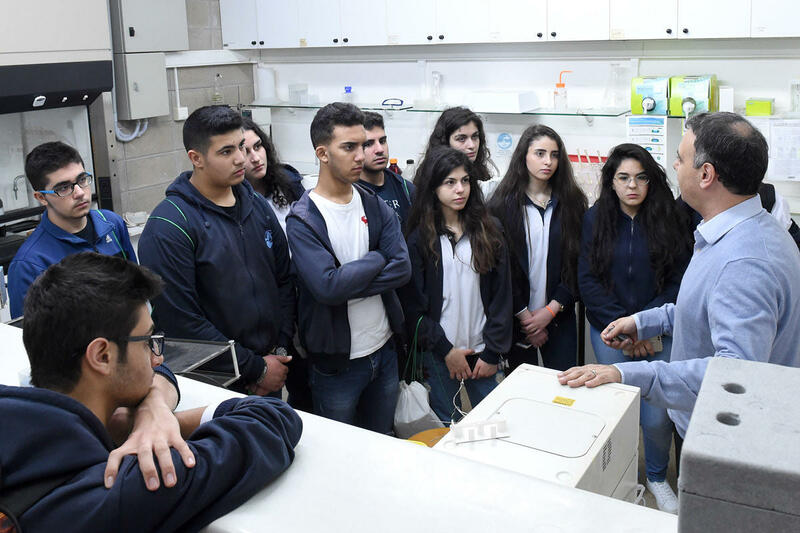 Yara Azar, who is graduating high school this year and planning on pursuing a pharmacy degree at LAU, was attending to solidify her career decision. “LAU was the natural choice for me, because after participating in the Model United Nations program, the university feels like home,” said Azar.